California is experiencing a severe drought. In the United Kingdom, it’s been raining for the past few weeks. And it’s record-breaking, natural wonder-toppling, train-halting rain. And more rain and flooding events are expected this week. The government and communities have been working tirelessly to respond to the flood risks (including the health risks of raw sewage seeping into flood waters). 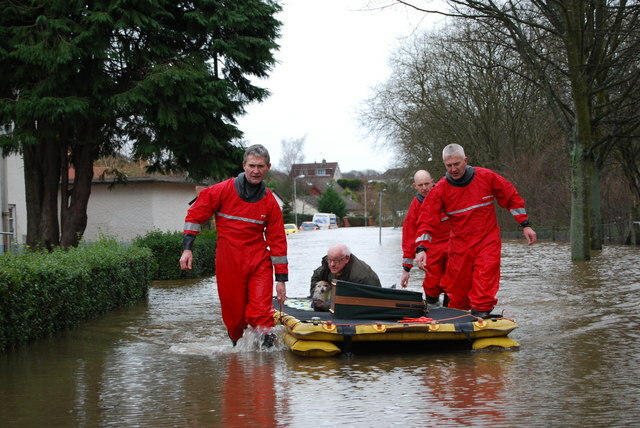 The Royal Marines have also played a very active role in the cross-government, multi-agency relief effort in Somerset. So has Prince Charles. But despite the preparations, weather events and natural disasters can have political consequences, and in the UK the finger-pointing has already begun. In an article titled “How long will the UK government keep its head above flood water?” Damian Carrington of the Guardian looks at recent budget cuts for flood defenses as one reason why communities were not adequately prepared. The UK Environment Agency chair has warned of “difficult choices” in deciding what to protect. Some are suggesting that protecting homes over farmland could hurt food security. The Environment Agency recently reported that No 10 Downing Street, home to the UK Prime Minister, is at risk of flooding. Choices, indeed. It is not clear what role such reports have played in UK preparedness strategies thus far. What is clear is that nations can learn from each other, and that the time horizon for studies looking at climate-related flood risks, and for the deployment of resources for building up flood defenses, should be moved forward. Once the waters settle, the UK would do well to take a look at lessons learned from Hurricane Sandy in the United States, and the U.S. political debate over flood insurance. The U.S., the UK and countries around the world could also do more to get beyond the politics of weather events (and austerity), and start taking preparation for these record-breaking risks seriously. By Caitlin Werrell and Francesco Femia in climate and security on February 10, 2014 .